The Lady Bulldog basketball team got its City of Champions Classic run off to a solid start Thursday at Bulldog Pit, besting the Lady Bears of El Paso Bowie 47-31 to advance to the winners’ bracket semifinal round. The Artesia girls came out gangbusters, shooting well under the basket and using quick, aggressive defense to force 21 Bowie turnovers in the first two quarters of play. A Gracie Tesillo bucket and Alissa Wagner trey gave the Lady ‘Dogs the early lead, and a jumper off the inbound pass by Paityn Houghtaling made it 7-2 just under two minutes in. Late baskets by Alexa Riggs and Gracie Puentes gave Artesia a three-point edge going into the second, 12-9, and although the Lady Bulldogs would go a bit frigid from the field in the final eight minutes of the half, nine points from the free-throw line helped keep them in front at the break, 27-15. “I thought the girls came out and played hard right away,” Artesia head coach Jeff Houghtaling said today. “I thought we came out with a lot of intensity and a lot of confidence, and we did a good job overall of shooting in our gym. I was real pleased with the effort. Artesia committed 18 turnovers of their own in the opening quarters but slashed that number in the second half while continuing to take the ball away from the Bears with a combination of full-court pressure and stifling D.
A slow offensive third for both teams saw the Lady ‘Dogs manage just eight points on a Wagner trey, an old-fashioned three-point play from Tesillo, and a free throw apiece by Houghtaling and Wagner, but the girls in orange would hold Bowie to just a single field goal in the quarter, that coming with one minute remaining. The Lady Bears stepped up their offense in the fourth, but with Houghtaling and Riggs logging offensive putbacks and Puentes and Kyrah Gonzales breakaway layups, Artesia was able to keep its lead in double digits through the horn, 47-31. Wagner led both teams in scoring on the night with 10 points, followed by Houghtaling and Puentes with nine and Tesillo with eight. With the victory, the Lady Bulldogs evened their record at 2- 2 as they prepare for a rematch at 6:30 p.m. today against Santa Teresa. 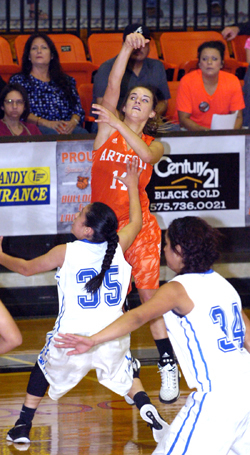 Artesia defeated the Lady Desert Warriors Dec. 1 at the Pit, 60-32. “I think Santa Teresa is going to come out with a lot more intensity than they did the last time we played them,” said Houghtaling. “Like we told the girls last night, we’re going to have to come out and match that and play smart, because they’re going to be looking to avenge the loss we gave them last week. The Lady ‘Dogs’ game will follow the tournament’s three-point shooting contest – set to begin between 6 and 6:30 p.m. – and Houghtaling again encourages fans to come out and enjoy an evening at the gym.